Home Book Now! Accommodations Rates Specials Amenities Gift Certificates Restaurant Photo Gallery Virtual Room Tours Tour Our Grounds Contact Us Book Direct and Save! When you arrive at the Crusader, in the heart of America’s favorite shore destination Wildwood Crest, you are guaranteed to receive a warm welcome from our friendly staff. 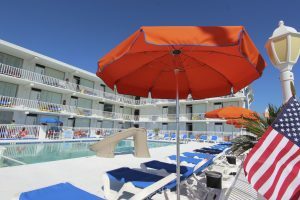 The Crusader Oceanfront Family Resort is located directly on the beach in beautiful Wildwood Crest, New Jersey. Wildwood Crest is considered by many to have one of the most beautiful beaches on the East Coast. Come relax to the sound of the ocean, the scent of cool breezes and warm sunny skies. Family owned for more than 49 years, we have created memorable vacations for our guests for generation after generation. Spring, Summer and Fall… Wildwood has it all! At the Crusader Resort, you’ll be surrounded by so many options for your seaside vacation. 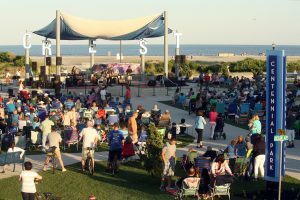 The Wildwoods are long known to generations of families for their activities and events year round. Within walking distance you will find a variety of activities such as surfing, tennis and basketball courts, a playground, bike and surrey rentals, a library and so much more. And, while staying at the Crusader you have a host of amenities at your doorstep to enjoy. We know that you have many options for your weekend getaway or family vacation here at the Jersey Shore. We appreciate that our guests consider us special enough to return year after year and hope that you too will come to enjoy our hospitality. Our clean, well-furnished accommodations offer you a great vacation by the sea. Please come and enjoy!